My name is Dave and I have been bodybuilding since I was about 15 years old. I was a super skinny kid and my parents bought me a 110 lb barbell set made of plastic covered cement plates. If you grew up in the 70’s, you may remember these! I played around with my weight set off and on for a few years without any real plan or routine, but i did become familiar with the basics. As I got older, I began reading all the bodybuilding magazines I could find, like Joe Weider’s Muscle & Fitness (Muscle/Power back then), Strength and Health and any others I could get my hands on. It wasn’t until I was 19 that I joined a gym and went there every day after school (I was commuting to Lincoln Technical Institute for Electronics technology) that I really began to build muscle. People started noticing and for the first time in my life, someone (a popular older student) actually tried to recruit me for a softball team! It was the first time I began to realize that the way I looked made people think I was strong and athletic! I found the older, bigger men at the club I joined in Allentown, PA were not arrogant “muscleheads”, but truly nice guys that often took the time to give me some tips and encouragement. I worked out regularly for a few years and was pretty happy with the results. 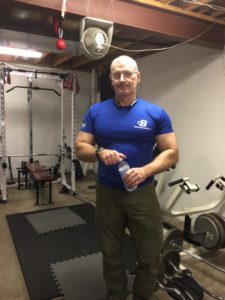 I have been bodybuilding on and off ever since, and have been an avid reader of Flex, Muscle and Fitness, Ironman and Muscular Development magazines for decades now. I am now 52 years old and I am probably in the best shape of my life. I workout at least 4 times per week, hitting each muscle group once per week with high intensity workouts. I am also an avid bicyclist, which to some degree is at odds with bodybuilding. Most cyclists try to minimize body weight in order to cycle faster and climb hills. I refuse to drop body weight if it means losing muscle! I just do my best at both disciplines and am content to be “pretty good” at both! I am a huge advocate of protein supplements, mostly due to the convenience and consistency of quality. I eat a lot of red meat, chicken and fish, but ALWAYS have a protein shake first thing in the morning, after every workout (weight or cycling) and last thing before bed. It has taken me years to create this website and I hope the information helps you to reach your muscle building goals!